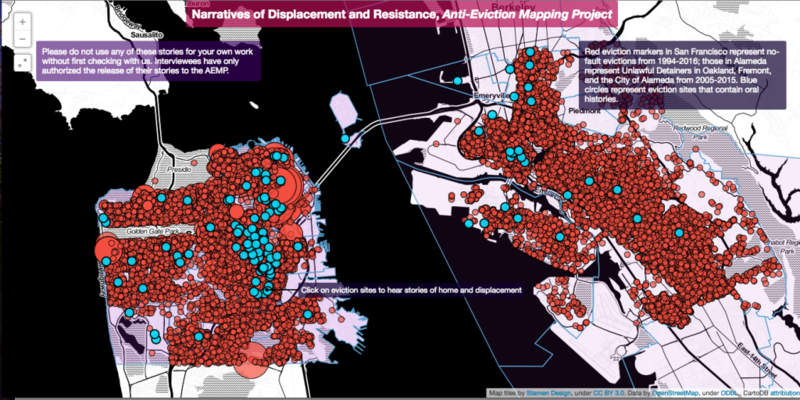 The project consist of a website for data-visualisation, data analysis, and storytelling collective formed to document and make visible the dispossession of San Francisco Bay Area residents and to facilitate and organise collective resistance. The project studies the displacement of people and the way in which evictions and gentrification target specific communities in the Bay Area. The website provides many resources and tools to help tenants to look up landlords and speculator information, it also tracks illegal vacation rentals with a crowdsource system. The project collaborates with many local groups who fight against displacement such as Eviction Free SF. Make this issue public, share stories, promote boycotts of serial evictors, protect tenants, facilitate collective resistance. Communicates the details of the issue, shares factual research to foster community resistance.